Sanctuary. Original painting in oil on canvas, 30 x 40 inches. SOLD. 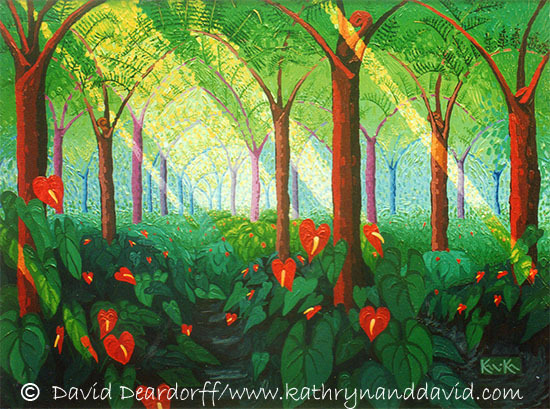 In Hawaii anthuriums were traditionally grown under a cover of tree ferns prior to the advent of modern monoculture cultivation in shade houses. One grower on the Big Island keeps one acre in the old style to honor his parents. The arching fronds of the tree ferns overhead are reminiscent of the peaceful quiet of a cathedral.